Return of the (un)Living Munchkins! Munchkin Zombies is a hit â€“ we had to order a second printing less than a month after its release! And the fans demanded more! Who are we to argue? Munchkin Zombies 2 â€“ Armed and Dangerous includes 112 new cards for Munchkin Zombies. Players can wield their Trained Attack Flies and Prehensile Tongue against the Zombie Gamer, or be the Rankest of the Rank and use the Power of SCIENCE against the dread Survivalist. Includes a new Power, â€œHungry,â€ and a new Mojo . . . the Patchwork Zombie! This is an expansion for Munchkin Zombies. It is not a stand-alone game. Description: 112 cards in a tuckbox. 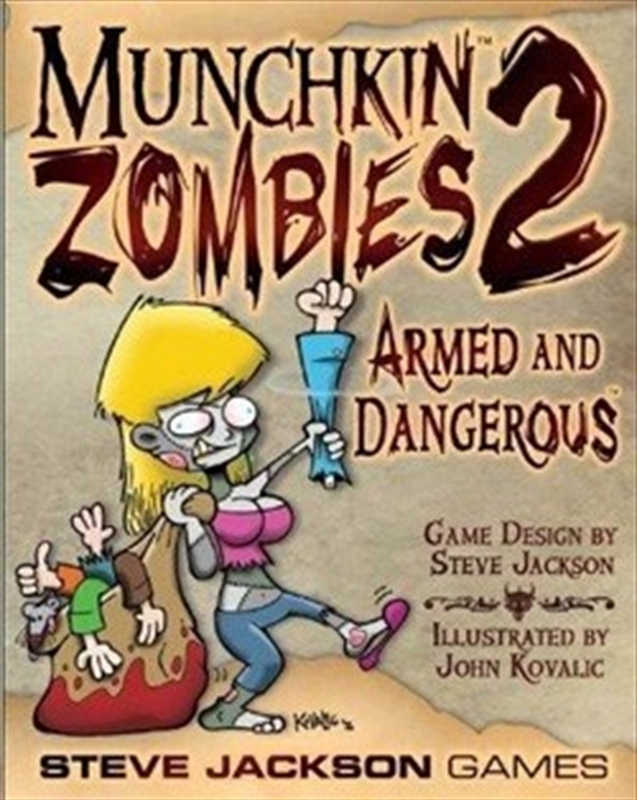 Related Products: Munchkin Zombies . . . and the whole Munchkin line. Tell the Players â€¢ Armed and Dangerous has a new Mojo (Patchwork Zombie) and a new Power (Hungry)! â€¢ More delightfully twisted cards from Steve Jackson and John Kovalic! BRAAAAAAIIIIINNNNS!